Natural, woodsy scent of Balsam Fir. Our Incense Pack contains 50 cones and a wooden burning base. Natural, woodsy scent of Balsam Fir. 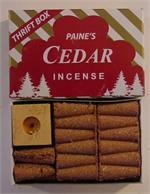 The 32 piece set from Paine's includes an incense burner for the Balsam Fir incense cones. Natural, woodsy scent of Balsam Fir. Our Incense Pack contains 24 each 2" long incense sticks and a wooden burning base. Natural, woodsy scent of Balsam Fir. 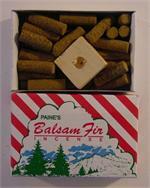 2" long Balsam Fir Incense sticks, 70 pieces per box. A cute way to burn your natural cedar or Balm Fire incense from Paine's Products in Maine. Log Cabin shaped wooden incense burner. Comes with 10 Red Cedar incense cones. The sweet, aromatic scent of Pinon Pine Trees. The 32 piece set from Paine's includes an incense burner for the Pinon Pine incense cones. True to the woodsy line of Paines products, these all natural incense cones have the distinctive fragrance of cedar wood. Pack contains 50 cones and a wooden burning base. True to the woodsy line of Paines products, these all natural incense cones have the distinctive fragrance of cedar wood. Pack contains 32 cones and a wooden burning base. 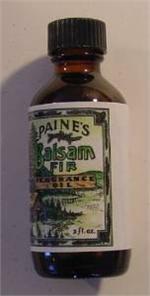 Paine's Products of Maine Balsam Fir oil. A half ounce bottle of woodsy, forest scent. 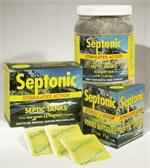 For fragrance diffusers, potpourri and other household scents. Paine's Products of Maine Balsam Fir oil. Two ounce bottle of woodsy, forest scent. For fragrance diffusers, potpourri and other household scents. Paine's Products of Maine Blueberry fragrance oil. A half ounce bottle of sweet mountain grown Blueberries. For fragrance diffusers, potpourri and other household scents. Paine's Products of Maine Cedar Wood fragrance oil. A half ounce bottle of fresh, rustic Cedar Wood scent. For fragrance diffusers, potpourri and other household scents. Paine's Products Sea Breeze fragrance oil. A half ounce bottle of Sea Breeze scent. For fragrance diffusers, potpourri and other household scents. Pure Ayre for Pets, 14 fl. oz. It's strong enough to get rid of really bad smells like cat urine and even skunk, yet safe enough to spray directly onto people and animals! Pure Ayre for the Home, 14 fl. oz. If you're looking for an odor eliminator that really works, without exposing you or your family to risky chemicals, choose the natural alternative. Choose PureAyre Home. Arrange your cookware and utensils with the Black Enameled Steel Oval Hanging Pot Rack by Range Kleen. Easily access your hanging cookware and utensils! 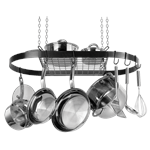 This attractive oval pot rack hangs from the ceiling with an upper shelf and repositionable hooks. 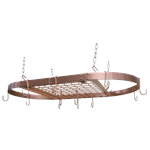 Organize your cookware and save cabinet space with the Copper Motif Oval Hanging Pot Rack by Range Kleen. The ceiling mounted Oval Hanging Pot Rack Bar features a stylish Copper painted finish, and is perfect for utilizing unconventional spaces. Since 1892, homemakers across America have depended on Ritz Duvateen Flannel Dusters to dust everything from polished wood to delicate ceramic figurines. They absorb dust in just one wipe! Reusable and safe for all surfaces. 100% cotton flannel. 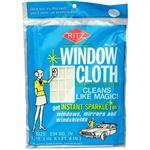 Once you try the Ritz Window Cleaning cloth, you'll never use anything else! Get instant sparkle on windows, mirrors and windshields. Also good for crystal chandeliers,cut glass and auto bodies. See N Sew book is a vibrant introduction to sewing that doesnt require a sewing machine or advanced skills. Durable, stainless construction holds 1 gallon of everyday kitchen compost.